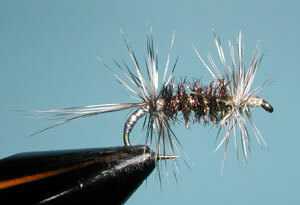 Like the Sierra Bright Dot, the Gray Ugly is a Fore and Aft pattern in which there are a Front and Rear hackle. 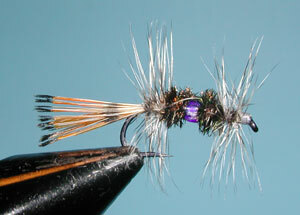 Ken Miller of Chatsworth, CA created a variation of the Gray Ugly using a beadhead body and golden tippet tails. According to Ken, he's had great success in the Sierras with this fly.